Maintaining productivity during any company relocation can prove challenging. Fitzgerald Commercial Movers uses its experience and efficiency to not only handle your move, but provide superior service throughout the process. For more than 35 years Fitzgerald has assisted Corporations with full relocations, providing the planning, manpower, equipment and efficiency to handle every detail from start to finish. 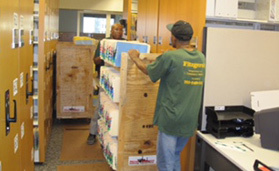 We stay on schedule and on budget while ensuring every desk, every computer and every single piece of furniture and equipment is carefully packed, transported and delivered from the current site to the new location. With a manager on site at every move and a highly-trained staff handling company property, Fitzgerald provides an experienced team for every client. When necessary, we offer short and long-term storage options ranging in size from 25 to 100,000 sq. ft. for items not yet needed in the new location. As an added benefit, Fitzgerald also offers Certified Records Destruction, ensuring documents and data are properly destroyed and disposed of ensuring they never fall into the wrong hands. Contact Us to discuss your Corporate Relocation plans and Fitzgerald will use its expertise to create a plan to execute your move on time and on budget. Our service will exceed your expectations.